It happens to the best of us—we get so swept up in preparing for college that we may struggle to make ends meet when it comes to securing school funding. Going to college often involves moving away from home for the first time and taking on new financial responsibilities that can demand a lot of time and energy. There can be many uncertain factors that prevent us from securing all our college funding. If you find that you need to secure funds right before school starts, you don’t have to go about it alone. 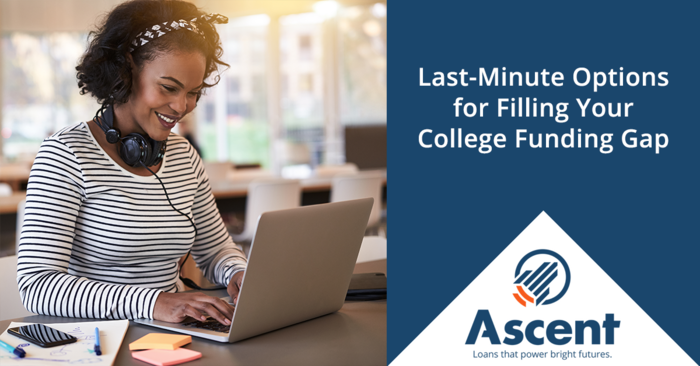 This guide, along with our other helpful blog posts, will help you explore the options you have to secure that last-minute funding for college. First, if you haven’t filled out the FAFSA (Free Application for Federal Student Aid) yet, be sure to do so as soon as possible. You may be eligible for grants and subsidized loans that can help cover your college funding gap. Even late or retroactive FAFSA filing can mean a serious boost to your college funds. College students who forgo filing the FAFSA miss out on nearly $9,800 in aid money, on average. Even if you file late and miss out on certain scholarship opportunities, your FAFSA application can still unlock federal student aid opportunities. Don’t make the mistake of forgetting the FAFSA—it’s meant to help students like you get the funding they need. If you filed a FAFSA already but you or your family’s financial situation has changed in the meantime, let your school’s financial aid office know. They may be able to offer additional help. Though it isn’t always easy to be transparent about financial challenges, the amount of aid you receive may be adjusted to reflect your current situation. In addition, the financial aid office may be able to offer guidance when it comes to constructing a payment plan that works for you. Asking for help is a sign of strength, so don’t hesitate to reach out when you need it. Though it may not seem significant in terms of securing funding, good financial habits still play a crucial role, even when it’s crunch time. When you know how to save and spend wisely, you’ll be able to thrive in a variety of situations and financial environments. Being resourceful goes a long way when it comes to saving money, and money you save in other aspects of life can be used for college expenses. Heading back to school doesn’t have to be a total splurge when costs are handled wisely. Good financial habits always make sense, regardless of which stage of college you’re in. Though it’s best practice to apply for scholarships as early as possible, there still may be some scholarships available at this stage. Check out the U.S. Department of Labor’s Scholarship Finder to see if you’re eligible for any late-deadline scholarships. Your school’s financial aid office may also be able to provide you with options for additional funding. When every little bit helps, be sure to explore all of the options available to you. A part-time job can help you bridge the funding gap and earn additional income. If you work enough hours to cover financial needs while still allowing ample time for studies and personal life, it can be a great way to make ends meet and build for the future. When it comes to finding the right job for you, start by searching college job boards, online postings or asking friends for leads . Additionally, there may be work-study opportunities available through your school. If you can, it’s ideal to find a job in a similar field to the one you are studying. If you can’t, that’s okay—as this job is a stepping stone to help achieve your educational goals. After you have explored other options, including those offered by the FAFSA, it may be appropriate to look into taking out a loan. The purpose of a private student loan is to bridge the financial gap between other forms of aid and your actual college expense. There are loan services that are customized to service students in similar situations as you. If you have a cosigner, you may be able to find a better rate on the loan as well as take advantage of other benefits. 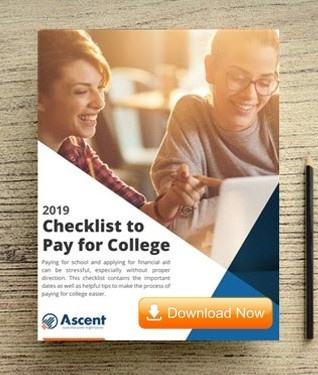 Ascent’s student resources and blogs are here to help your peace-of-mind when it comes to paying for college. Whichever path you take to fund your college years, we wish you a successful educational future.